Black Panther has passed The Wizard of Oz to become Rotten Tomatoes top movie of all time. The aggregated review site keeps a list of the top 100 movies, based on the number of reviews a movie receives and how positive those scores are. 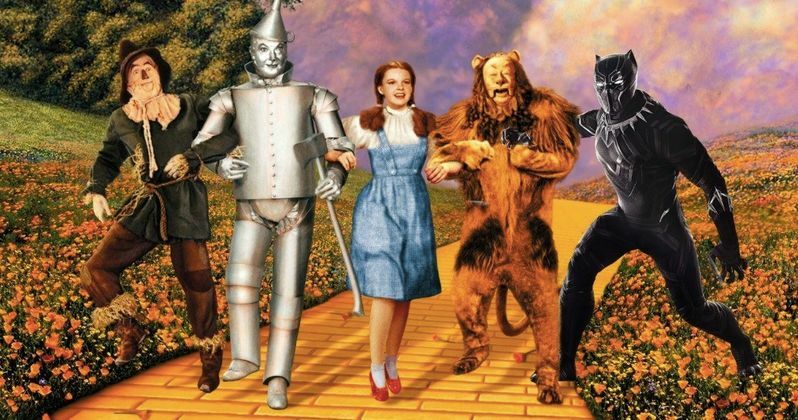 The wave of overwhelming positivity has helped push Marvel's latest to the very top, above some of the most classic movies ever made, including The Wizard of Oz, which has held the number one spot on the list for quite some time. But there's a new king in town and his name is T'Challa. Rotten Tomatoes' top 100 movies of all time list takes into account every movie on their site with at least 40 different reviews counted. They then use what they call their "Adjusted Score" to determine the ranking. Their Adjusted Score is said to account for the variation in the number of reviews per movie and uses it as a weighted formula to determine the ranking. Whatever the case may be, their formula has placed Black Panther above the likes of The Wizard of Oz, Citizen Kane and The Third Man. The Wizard of Oz has a better Tomatometer score, with 99 percent. The movie has 110 reviews counted and just a single one of them is negative. Black Panther may have the lower score, sitting at 97 percent, but with 310 reviews counted, that helped it rank higher on Rotten Tomatoes' list. It's also worth noting that this isn't the only recent movie in the top ten. Get Out is currently sitting at the number five spot on the list, with Call Me by Your Name, Mad Max: Fury Road and Paddington 2 coming in at six, seven and eight. The Cabinet of Dr. Caligari and All About Eve round out the top ten. Inside Out and Lady Bird are both sitting just outside the top ten at numbers eleven and twelve, respectively. Rotten Tomatoes' list isn't afraid to put new movies above old classics, which is interesting. In any case, it's Black Panther on top. For now at least. While many may not actually consider Black Panther to be the greatest movie ever made, this does signify just how much people seem to love this movie and how it really has become the movie of the moment. Who knows? Maybe Avengers: Infinity War will be as great as everyone is hoping and that will take the top spot in a few months. This is just another example of just how much Black Panther is resonating and how big this movie really is. Marvel's latest has already beat Justice League's domestic box office total and shattered records left and right in its opening weekend, and it looks like it will continue on its path of dominance in the coming weeks. Is it the greatest movie of all time? Probably not, but it has certainly achieved greatness already. You can check out the full list of the top 100 movies over at Rotten Tomatoes.